Shihan Martin Marlborough started his martial arts career at the age of 10 years old in Dundee with boxing. He boxed for the Royal Navy on six occasions, also sparring with people like Joe Bugner, before his rise to fame, as well as training in Judo. In 1972 he joined the Perth Karate Club, training under Sensei David Stratton. For extra training he joined the Perth boxing club with the late John Kelly, a well respected boxer in his time and a very strict coach. Martin progressed in Shotokan Karate to reach the rank of Third Dan and then in 1983 he started to change his clubs to Kyokushin Karate. After two years he made the grade of first Dan once again and progressed back up the ladder to reach the grade of 6th Dan, Shihan, which he was awarded in 2010. In 1991 he was appointed Branch Chief of Scotland by the founder of Kyokushin, Sosai Masatatsu Oyama, 10th Dan. 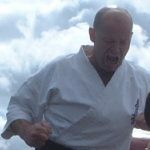 After visiting Japan on several occasions Martin has become an international Referee and Judge and a member of the Kyokushin GB grading panel. 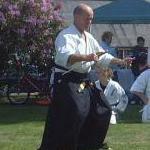 Martin specialises in Kata applications. 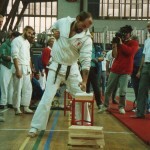 Bunkai, (the use of the kata techniques as self defence) and in submission Jujitsu (Grappling). Also having spent some time in the Special Air Service (TA) Martin is an expert in defence against weapons. 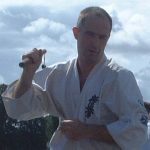 Shihan Martin has fought many times for his country and in 2005 he represented GB in the Senior world tournament in Japan. In 2006 he faught in the European senior tournament in Italy and in August 2009 he became the first person to represent Scotland at the World Senior Tournament in Japan. 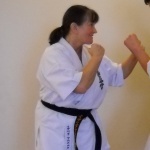 Sensei Belle Marlborough started training in 1973 at the Perth Karate Club in the Caledonian road school where she progressed to the rank of 1st Dan in Shotokan. Belle left Karate for a while in 1980 to teach aerobics, weights, and Combat aerobics (Which she still teaches). She returned to Karate in 1990 and progressed again to the rank of 1st Dan in Kyokushin Karate. 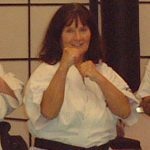 Belle was The first Scottish Woman to fight Knockdown, the first to become an International Judge and grading official, and again the first Woman in the Kyokushin GB ( Scotland, England, Wales ) to reach the rank of 3rd Dan. Belle is well known for high standards and Kata technique. 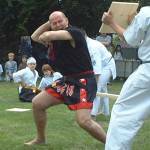 Senpai Brian Crighton started karate in 1983 after watching a karate demonstration in Scone park. He joined the Shotokan Katana Karate dojo in Scone under the instructor Senpai Dave MacNamara. 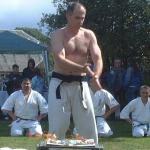 Under the leadership of Shihan Martin the Perth, Scone and Crieff Shotokan clubs converted to Kyokushin in 1984. 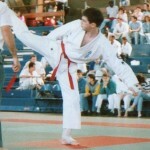 Brian trained up to the level of 1st kyu and fought in the National Knockdown tournaments at Crystal Palace in 1987 and 1988. In 1989 Brian represented Scotland at a novice international knockdown tournament in France where he was defeated by Gavin Rush who went on to win the British Heavyweight title the following year. Brian took a break from karate in 1992. He returned in 2005 and went on to pass his Shodan in 2008, 25 years after starting the journey. In 2006 an 2007 he represented Scotland fighting Clicker at the annual Scotland v England v Wales tournament. Brian was third in the British Open Men's Kata competition in 2009 & 2015, second in 2010 2013 & 2014 and first in 2012. In 2015 he represented Scotland at kata in the European Open in Berlin. 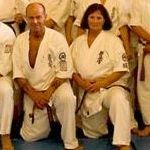 Brian was the dojo operator for the kick boxing classes in Crieff from 2008 to 2009 and took kata and conditioning classes at the Perth dojo from 2013 to 2015. 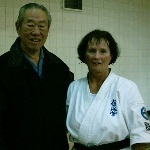 In 2011 Brian passed his Nidan. He also has a passion of Kobudo, Nunchaku being his speciality at demonstrations.